At times when wireless connections don't work well, I'm glad I have wired Ethernet connections in my home. 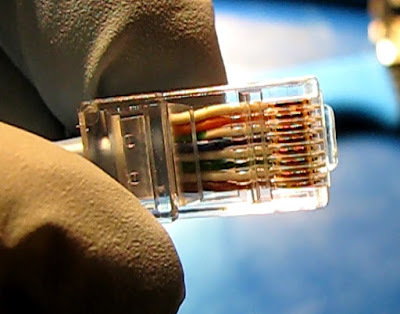 In this post I will show how to make a patch cable with two RJ45 ends. 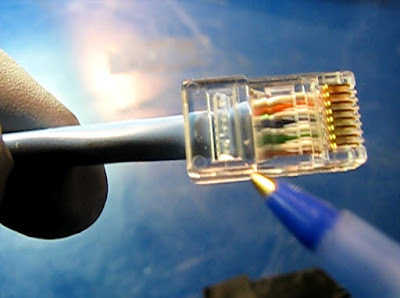 In this example, I had a piece of cable with an RJ45 jack on one end already. I only had to crimp the other end to match. 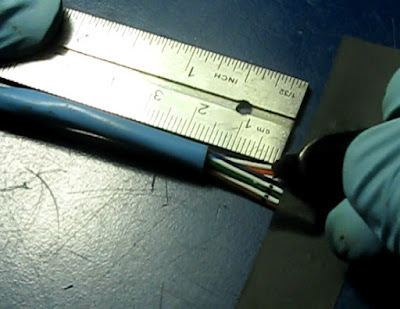 1) Determine the cable length needed and cut the cable to that length. 2) Strip off at least 1" of outer insulation from the cable. The tool has a outer cover stripper built in. 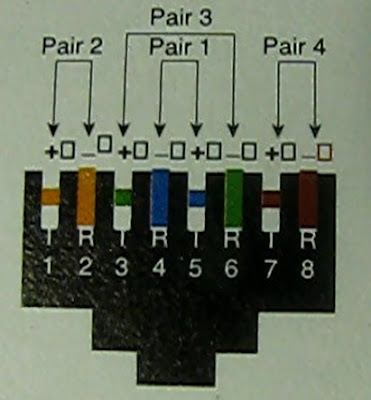 3) Determine which type of wiring configuration to use, 568A or 568B. Just so both ends are the same. Either will work, but the "A" is considered the more newer and apparently preferred arrangement. One end of my cable was done up in the "B" manner and gave me no choice but to match that. 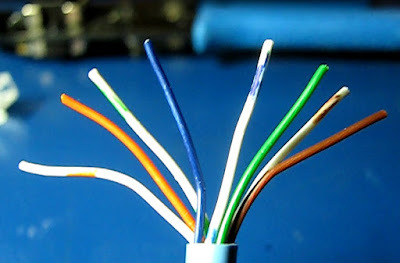 4) Arrange the wires in the scheme chosen. From left the right I set them up white/orange stripe, orange, white/green strip,blue,white/blue stripe, green, white/brown stripe, brown. Teasing them out in the correct order can be challenging and tedious. 5) I find it helpful to temporarily hold the wires in position with some electrical tape and then mark the 14mm clip point. 6) Clip the ends off even with the tool cutter function Leave no more than 14mm (9/16") between the outer insulation and the end of the individual wires. It is important to leave enough insulation to be crimped by the lower part of the crimper. 7) Position the jack with the metal plates up and feed the wires into the guide slots. 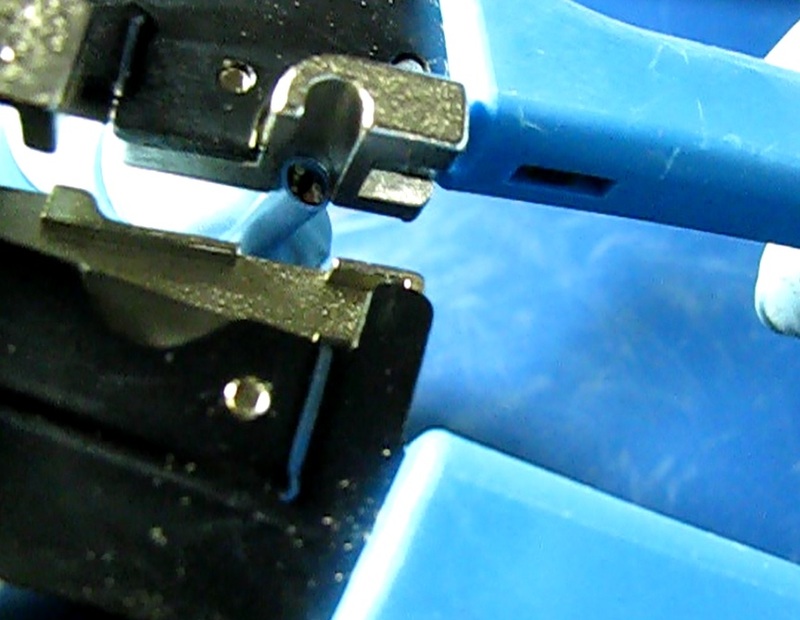 These are little slots molded into the jack to keep the wires dressed properly as they are inserted. Push them all the way in to the end. NOTE: do NOT strip the wires. 8) Make sure the outer jacket is in the lower crimp zone. If not push the cable further into the jack. 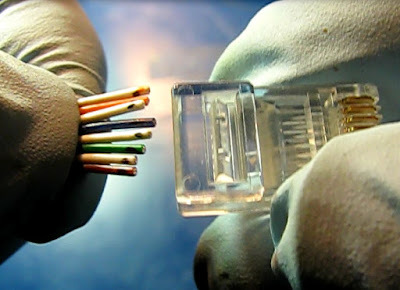 The outer jacket must be crimped along with the individual wires. 9) Insert the RJ45 jack with uncrimped wires into the RJ45 crimp fixture. This tool comes with both RJ11 and RJ45 fixtures. 10) While making sure the wire does not move in the jack, fully compress the handle on the tool to complete the crimp. It doesn't hurt to repeat the crimp a second time. 11) Check for a good crimp, Making sure the outer insulation was crimped by the lower crimper. 12) Test the cable in a known good wall jack.